Hello m'fellow Trustinvoguers and newbies! I hope you're all well! A little bit off the side from my regular fashion and beauty blog posts, I would just like to ask a favour of you all. This is, to everyone who follows my blog, who are family, friends, or even just mere readers of Trustinvogue.com. I ask if you would PLEASE vote for me in the Cosmopolitan Blog Awards for Next's Best Newcomer Award. I would literally mean the world to me, and would most likely make my year. After passing my driving test (FINALLY) and getting into university, this would be the icing on top of the cake. No, infact - the very cherry on top of the cake! - Enough about cakes, it's making me feel hungry! But yeah, I would just like to take this opportunity to thank everyone that voted for my blog to get Trustinvogue into the shortlisted top ten out of 43,000 entries! Amazing! Wouldn't be in this position without my readers. You're the reason it gives me such joy to write. 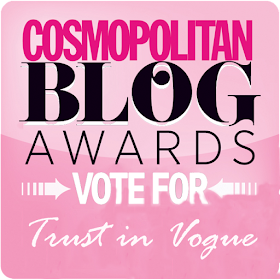 If you enjoy Trustinvogue, please feel free to vote for me! Voting closes at the end of August. I just voted for you, good luck gorgeous!